It's my favorite time of the holidays. Time to get all "gussied up"-southern for "fancy" and hit the town. 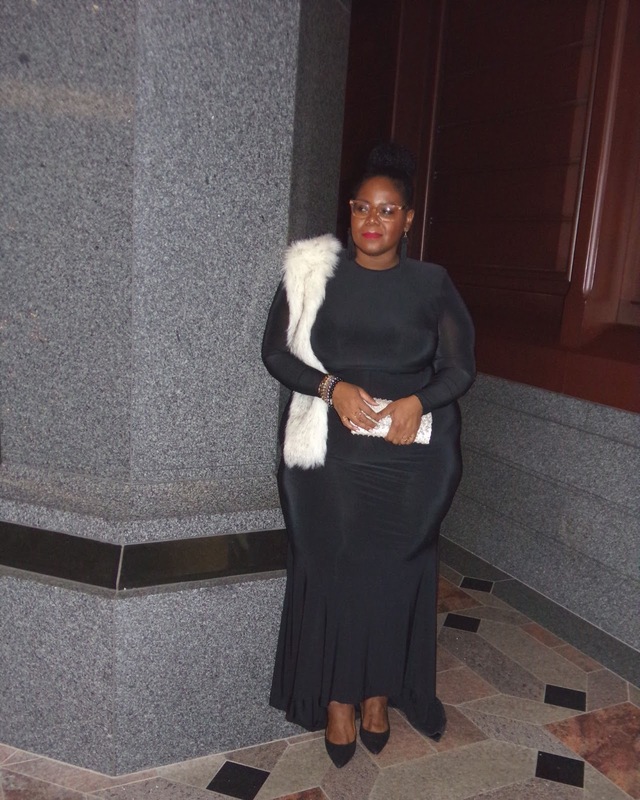 And this past weekend, I had the grand experience of dressing up and going to a holiday party with my Framily (Friends+Family). Don't you just love dressing up and getting all pretty for the holidays? I had just mentioned to someone I needed a dose of "Fancy dressing" in my life and this was just right. A night out with my favorite girls, no stress, good food, drinks, music and the opportunity to wear my latest reasonable holiday finds from Club L at ASOS.com. Now, if you're not familiar with the Club L collection at ASOS.com, allow me to share one very specific fact....These suckers can run small. So if you plan on rocking a slinky piece like this, be prepared to share your blessings with the world. 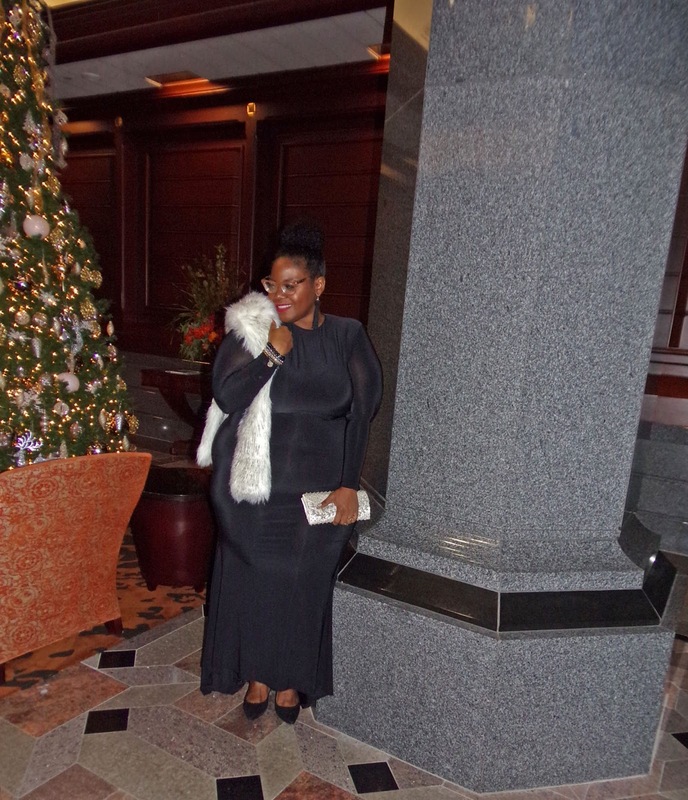 I recently purchased the Club L Plus Open Back Fishtail Maxi Dress during the Asos.com After Thanksgiving Day Sale. The dress was a no-brainer for $35 bucks, but it was more than just the price of the dress that caught my attention. I've been wanting to rock one dress that carries no apologies for a while now. 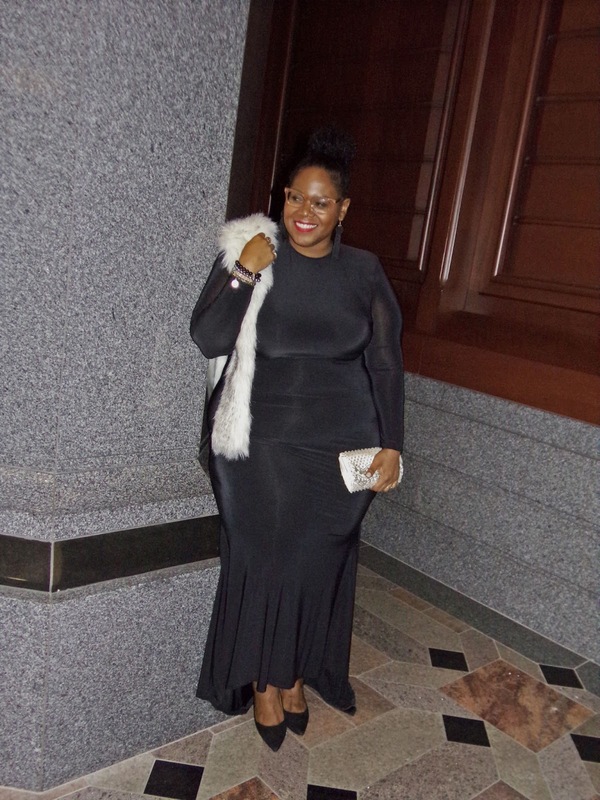 A dress that says all these curves are perfectly placed and carried with no doubt. Yup...That is the dress for me. And this dress delivers all that for a price under $50. This fishtail maxi evening dress is perfect for a holiday shindig. I referred to it my "mullet" dress. The business of a crew style neckline that covers everything and the long sleeves could have you thinking this is not for the evening, but once you turn the corner those who have admired you from the front will receive a sweet treat from the back as this dress has a long fishtail train and open back that assures you she is ready for the party. Of course you stand help but to demand all the attention in a piece like this, so enjoy yourself!! I did. Ready to Get My Look! !